Pastor Trisha Peach struggled for several years with symptoms that doctor after doctor could not figure out. 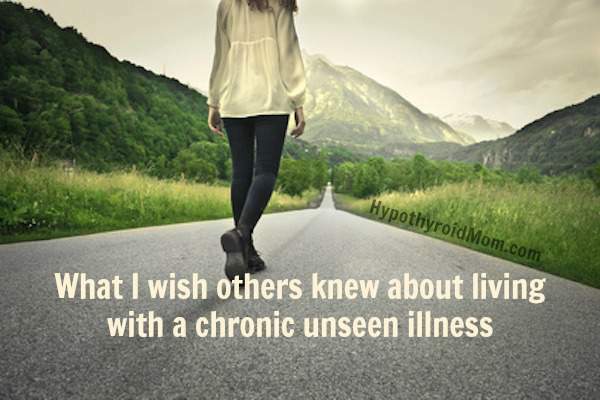 It would turn out that she was struggling with the thyroid autoimmune condition Hashimoto’s, a chronic illness that goes unseen by people around you. 1. I may look fine on the outside but I’m not fine. It may have taken 2 hours to look decent enough to leave the house (cover the dark circles, the broken off fingernails, etc.) Some illnesses are not readily apparent on the outside. 2. It is terrible to not know how you will feel the next day. It makes planning nearly impossible. Many humans take for granted that they will wake up feeling “normal”, go to work, go see friends, go to their child’s sports game – same as always. For someone battling a chronic illness, you just don’t know. Instead of “planning”, it’s more like “hoping”. You “hope” you wake up feeling ok, you “hope” you can make it through work, you “hope” you can make it through your child’s play…..and each event takes its toll on your energy and health. You cannot predict the day before how you will feel. So the world makes plans and prepares for events and you…..”hope” to be a part of them. 3. When you miss an event it is NOT because you do not want to be there. It is not because you no longer care or because the event is not important to you or the person is not important to you. You are missing out because your body has given out. In fact, your body may be 4 or 5 events PAST too many by the time you just give out. It’s like driving a car that is running out of gas….you lasted on fumes, but finally despite all your efforts, the fumes have run out. The gas pedal is all the way to the floor, but she’s not going any further. 4. Yes, yes…we DO realize we have been sick a lot. Pointing it out doesn’t help. It just makes us feel like a failure, like we have control over this illness and that we are somehow choosing to stay sick. I’ve actually heard these bits of “advice” from people over the past 2 years. 5. Some illnesses cannot just be “cured”. Some illnesses are only “managed” to various degrees. When we are little, we think that if you are sick, you go to the doctor and get a pill. Then you take the pill and get better in a very short time. Then you go on with your merry life. And it is a shock that even in 2015 in a 1st world country, there are still illnesses (MANY of them) that have no cure. Doctors are NOT God. They do NOT always know what is wrong with you. And sometimes they will guess and be wrong. Sometimes they will never find out. Sometimes they will try different treatments for years, and not find one that works. And most frustrating of all…..what works to treat one person, may not work to treat another. Each person is different, and each person’s body responds differently. 6. A “chronic” condition never goes away. It is never cured. It will flare up without warning and last for an unknown amount of time. No one will know what triggers it. And you have NO control as to when and how badly the symptoms will pop up. 7. It is NOT done for attention. In fact the extra attention is usually embarrassing and makes the person feel like they are failing. People who are truly living with a chronic condition are NOT hypochondriacs. People with a chronic condition will usually try to hide it, make excuses (oh I have a headache again) (Oh I’m too tired), and will push for as long as they can…..
8. And the most important thing I wish everyone knew: people who battle a chronic illness are NOT weak. They spend 24/7 battling an illness, while loving and caring for their families, working their jobs and even pursuing their dreams. Some of these people who push through every single day – like my mother, two of my dear friends – they are not weak. They are some of the strongest people I know. Want to help or encourage that person in your life who is battling a chronic unseen illness? Tell them you see how hard they are working and how much they are getting done. Tell them none of this is their fault. Tell them to keep fighting and to never give up. Tell them how much they are needed. Be understanding when flare ups happen and offer to chip in however you can. Tell them how special they are to you, and how they brighten your life just by BEING – not for anything they say or do. And treasure that person, every single day they are in your life! Founder of the blog peacht, ordained minister, staff pastor of 16 years, speaker, trainer and consultant. More importantly, Trisha is a busy working wife and mom! She is also a sci-fi junkie and sushi enthusiast. I am 47 years old now, I was born with Graves Disease, had my gland removed at 18 (95% of it). The 5% they left, grew back with a vengeance. At 47, ( just 2 weeks ago) I had it removed again. It’s been an emotional, physical, mental rollercoaster. I wish family understood what it feels like inside, because what you see on the outside is just a front. I hide my anxiety, irrational thoughts and emotional meltdowns. If anyone needs a friend and support… contact me [email protected].